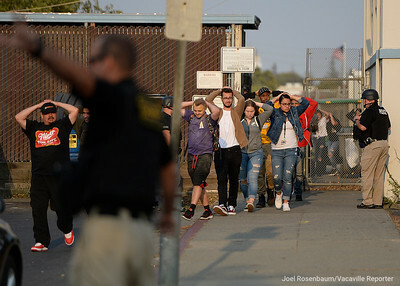 Fairfield Police monitor students and parents as they exit E. Gary Vaughn Gymnasium at Armijo High School Friday after they lifted a lockdown at the school When a suspect from a late afternoon shooting ran onto campus and tried to hide among approximately 500 students and parents who had been moved from the stadium to gym during the lockdown. 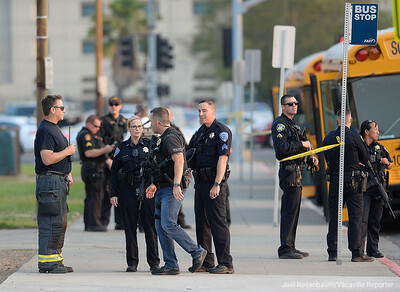 Officers were able to capture the suspect peacefully. 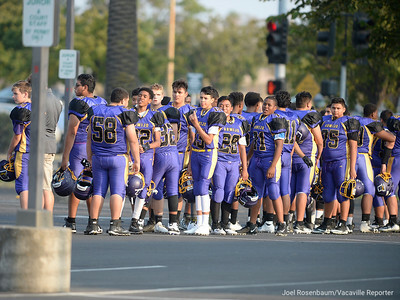 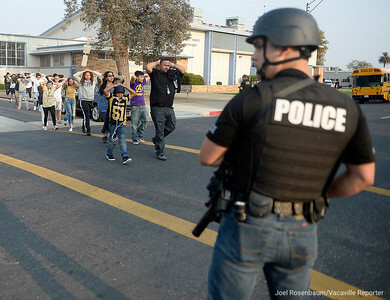 Members of the Armijo High School junior varsity football team stand in the parking lot across from the Armijo campus as they clear E. Gary Vaughn Gymnasium where they had been sent with approximately 500 students and parents who had been moved from the stadium to gym during a lockdown at the school when a homicide suspect fled from police and entered the campus. 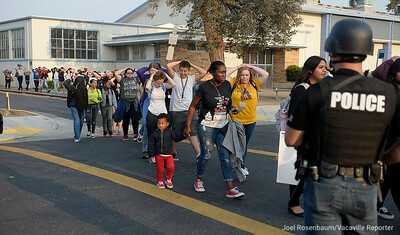 Deputies from the Solano County Sheriff's office and the Fairfield Police Department direct some of the approximately 500 students and parents to the juror parking lot at Texas Street and Washington Street as they clear E. Gary Vaughn Gymnasium at Armijo High School following a lockdown at the school while searching for a homicide suspect who ran from the crime scene to campus and hid in the gym. 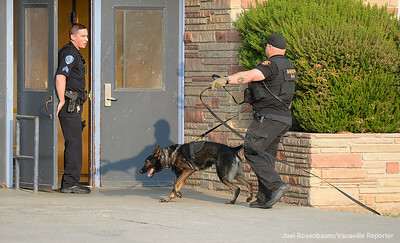 A Solano County Sheriff's K9 officer enters E. Gary Vaughn Gymnasium to search for items that homicide suspect may have dropped as he hid in the gym with approximately 500 students and parents who had been moved from the football game when the campus was placed on lockdown. 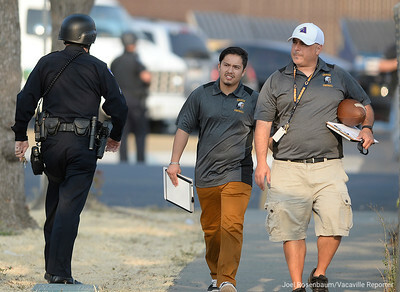 Members of the Armijo High School football staff walk past a Vacaville Police officer to a parking lot across from the Armijo campus as they clear E. Gary Vaughn Gymnasium where they had been sent with approximately 500 students and parents who had been moved from the stadium to gym during a lockdown at the school when a homicide suspect fled from police and entered the campus. 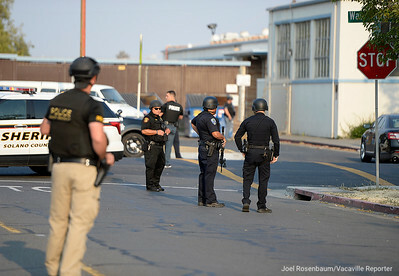 Officers from the Vacaville and Fairfield Police Departments and Solano County Sheriff's office maintain a perimeter outside E. Gary Vaughn Gymnasium at Armijo High School following a shooting at Bell Avenue and Washington Street killed a 16 year old boy and critically injured an 18 year old man. 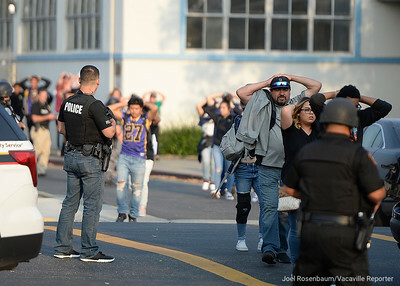 Late afternoon shooting in Fairfield leaves 16 year old boy dead and 18 year old man in critical condition at area hospital. Police have two suspects in custody after one fled onto Armijo High School campus.